In the first year of Genji (元治, 1864), Natsuo´s firstborn son saw the light of day. The first year of Genji was the year of the “wood rat” (kinoe-ne, kôshi or kasshi, 甲子) which in turn was the very first year of the sexagenarian circle and was thus very auspicious, and so he named his son “Kinekichi” (甲子吉, lit. “lucky one from the year of the wood rat”). Natsuo describes those times in his Tsuisô-roku (追想録, “Records of Recollection”) published in Meiji 15 (明治, 1882) as follows: “The number of orders and of the people (he meant his subcontract workers like, for example, Tomekichi [留吉], Hikota [彦太] and Kakuzô [恪蔵]) increased, and that now with Fuyu and Kinekichi the house became too small and so after five or six years we moved to the second block of Chôjamachi (長者町) in Edo´s Shitaya district (下谷, about 3 km to the north of the old house in Kanda-Sakuma, 神田佐久間町).” Well, Kinekichi was raised and trained to become Natsuo´s successor one day. He used the craftsman´s name “Fuyuo” (冬雄) but did not have time to step out of the shadow of his father as he died in the eleventh month of Meiji 20 (1887) at the young age of 24. 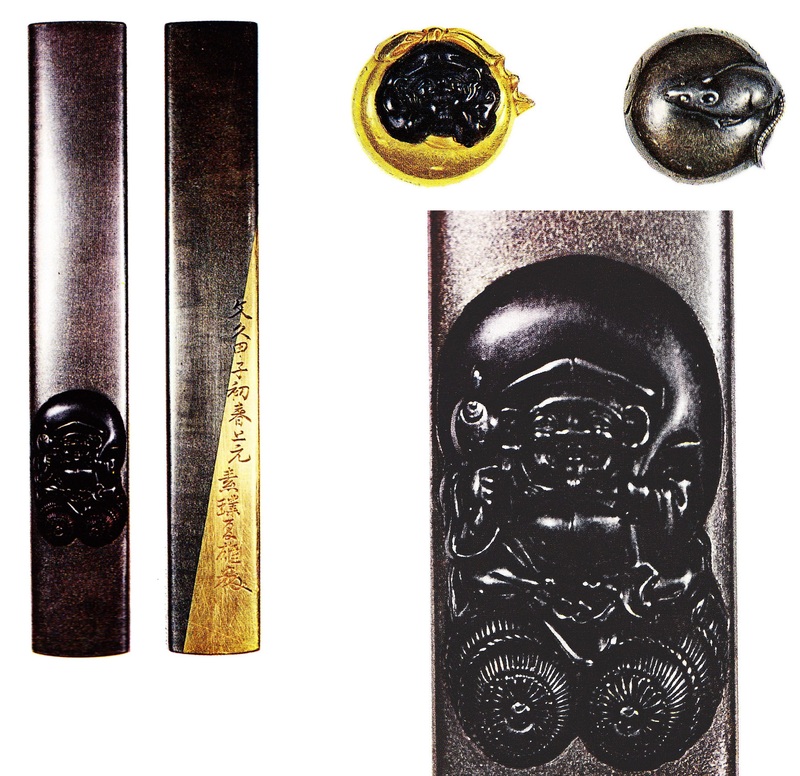 In the same year kinoe-ne, Natsuo made a futatokoromono set (see picture 1) consisting of a kozuka and a pair of menuki, depicting Daikokuten (大墨天) and a rat, as it was the year of the rat and as the rat is regarded as messenger of Daikokuten. So maybe Natsuo picked this motif of one of the Seven Lucky Gods as auspicious sign for this happy event of being blessing with a son in that very year. 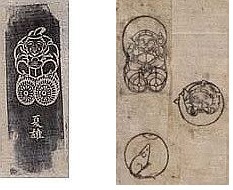 Another fascinating aspect of this motif is that Natsuo even made a Daikokuten painting at the same time which is still extant and mounted as hanging scroll (see picture 2). Also we find in one of his sketchbooks a rubbing of a Daikoku which he had engraved to the kogatana blade of a kozuka (see picture 3). And this Daikoku carving and its signature in turn were engraved by the swordsmith Hosoda Heijirô Naomitsu (細田平次郎直光) onto one of his tantô. Interesting is that Naomitsu – who is better known under his pseudonym “Kajihei” (鍛冶平), the name under which he focused on forgeries of shintô, shinshintô and also of kotô blades after the ban on swords in 1876 – decided for himself to add Natsuo´s kaô under the signature which is not there at the original carving on the kozuka blade. Picture 2: The hanging scroll. Picture 3: The rubbing of the Daikoku engraving on a kozuka from one of Natsuo´s sketchbooks (left) and the sketch for the Daikokuten-futokoromono (right). Well, Naomitsu alias Kajihei was a student of Jirô Tarô Naokatsu (次郎太郎直勝, 1805-1858), the son-in-law and successor of the famous shinshintô swordsmith Taikei Naotane (大慶直胤, 1778-1857). There was a certain connection between Natsuo and the Naotane lineage of swordsmiths. One of his students namely, Tsukada Hideaki (塚田秀鏡, 1848-1918), was the adopted son of Hata Naoaki (畑直鏡), who in turn was a student of Jirô Tarô Naokatsu. Also we know from Natsuo´s records that a blade of Naomitsu´s master Naokatsu showed a Daikokuten engraving similar to this one. So it is rather likely that this blade is an hommage to both Naokatsu and Natsuo as it is fully signed by Naomitsu and we can thus probably rule out that it was intended as whatever forgery. This is also supported by the fact that it was made in Keiô two (1866), i.e. ten years before the ban on swords and Naomitsu´s “career” as forger Kajihei. Another interesting allusion to Natsuo´s Daikokuten carvings is Naomitsu´s explicite use of the kinoe-ne day in his signature. The kinoe-de day is an auspicious day every sixty days in accordance with the sexagenary circle. Incidentally, the kinoe-ne day was the eighth day of the ninth month Keiô two. So this blade gives on the one hand an interesting insight into the career of Naomitsu before he focused on forgeries, and on the other hand also an interesting insight into the time when Natsuo´s first son Fuyuo was born. This futatokoromono and the blade of Naomitsu are featured in my upcoming book Kano Natsuo – His Life, his Art and his Sketchbooks.